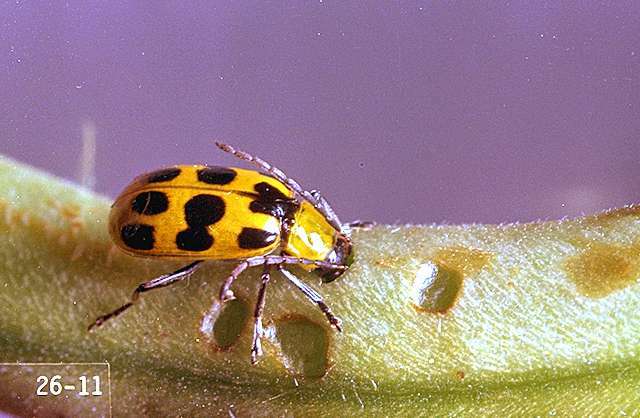 Pest description and crop damage The western spotted cucumber beetle is yellowish green, 0.25 inch long, and has 11 black spots on its wing covers. 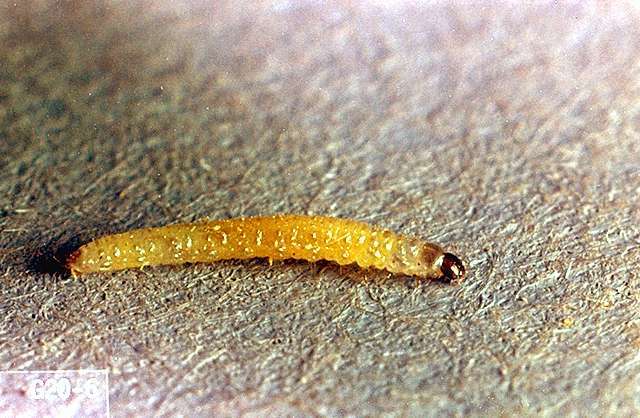 Mature larvae are white and about 0.62 inch long. The head and last abdominal segment are dark brown. A close relative, the western striped cucumber beetle, is yellowish and has three black lines down its back. The larvae live in the soil where they feed on roots, but adults are foliage and flower feeders. Cucumber beetle adults eat small holes in the leaves and flowers of many crops. Larvae feed on roots and bore into the base of stems. Biology and life history Cucumber beetles overwinter as fertilized adults and are active beginning in early spring. Adults lay eggs at the base of plants. Eggs hatch in 7 to 10 days, and larvae feed in roots for about 3 weeks before pupating in the soil. Adults emerge in 2 weeks and begin feeding on pollen. As soon as they hatch, larvae begin to feed on plant roots. They complete their development in the soil. It takes 30 to 60 days to complete a life cycle. There are two generations a year. Pest monitoring Specific treatment thresholds have not been established for these foliage feeders. Late-year infestations are insignificant. If numbers are damaging during mid-year, excessive foliage loss may reduce crop production. 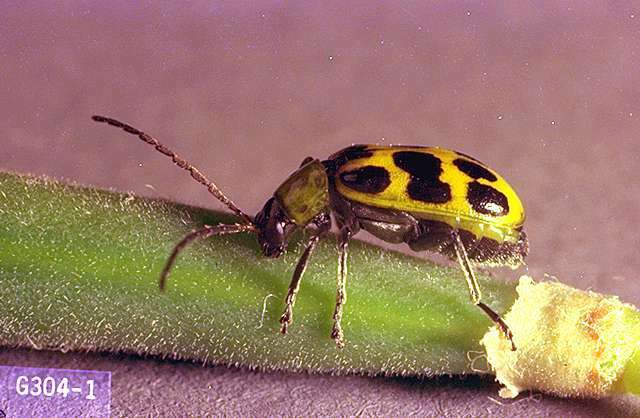 In Virginia, the recommendation is to prevent cucumber beetle damage to seedlings by treating when population reaches 1 beetle per 10 row ft.
Commercial row crop covers provide good protection from cucumber beetles, and in addition provide late frost protection and help in moisture retention. 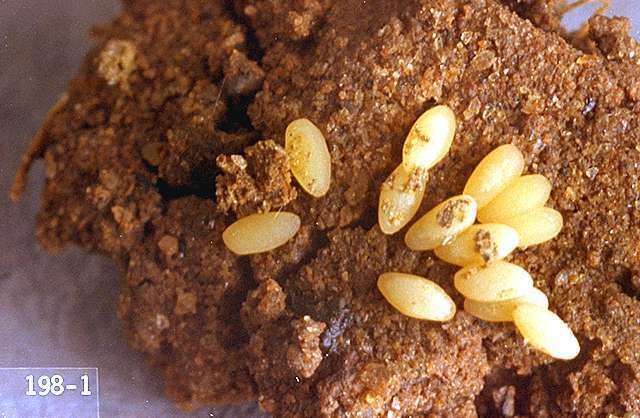 Sometimes, the timing of a crop planting can be delayed until after beetles have dispersed and deposited most of their eggs. Delaying planting until warmer weather also gives crops a greater chance of outgrowing beetle injury. Trap crops sometimes can be used to draw beetles away from the main crop. Trap cropping is an unproven control method in Oregon. Apply when beetles first appear and repeat at 7- to 10-day intervals as needed. acetamiprid (Assail 30SG) 0.047 to 0.1 lb ai/a. PHI 0 days. REI 12 hr. Retreatment interval 5 days. Do not exceed 5 applications or 0.5 lb ai/a per season. beta-cyfluthrin (Baythroid XL) at 0.019 to 0.022 lb ai/a. PHI 0 days. REI 12 hr. Do not exceed 0.088 lb ai/a per season. Retreatment interval 7 days. bifenthrin (Brigade WSB, Sniper) at 0.05 to 0.1 lb ai/a. PHI 3 days. REI 12 hr. Do not exceed 0.3 lb ai/a per year. Do not make more than two applications after bloom. Retreatment interval 7 days. bifenthrin/ zeta-cypermethrin (Hero) at 0.04 to 0.1 lb ai/a. PHI 3 days. REI 12 hr. Retreatment interval 7 days. Do not exceed 0.4 lb ai/a per season. Limit 2 treatments after bloom. carbaryl (Sevin 4F) at 1 lb ai/a. PHI 3 days. REI 12 hr. Retreatment interval 7 days. Do not exceed 6 lb ai/a per year. Phytotoxic under certain conditions. chlorantraniliprole/lambda-cyhalothrin (Voliam Xpress) at 0.088 lb ai/a. PHI 1 day. REI 24 hr. Retreatment interval 5 days. Do not exceed 0.18 lb ai of lambda-cyhalothrin or 0.2 lb ai of chlorantraniliprole per acre per growing season. chlorantraniliprole + thiamethoxam (Voliam Flexi) at 0.1 to 0.175 lb ai/a. PHI 7 days. REI 12 hr. Retreatment interval 7 days. Do not exceed 0.172 lb ai of thiamethoxam or 0.2 lb ai of chlorantraniliprole per acre per growing season. clothianidin (Belay) at 0.05 to 0.067 lb ai/a foliar or 0.15 to 0.2 lb ai/a soil band, in-furrow, sidedress, drench, chemigation. PHI 7 days foliar, 21 days soil. REI 12 hr. Retreatment interval 10 days foliar. Do not exceed 0.2 lb ai/a per season. cyfluthrin (Tombstone) at 0.038 to 0.044 lb ai/a. PHI 0 days. REI 12 hr. Retreatment interval 7 days. Do not exceed 0.175 lb ai/a per season. cryolite (Kryocide) at 8 to 12 lb ai/a. PHI 14 days. REI 12 hr. Retreatment interval 10 days. Do not exceed 48 lb/a per season. deltamethrin (Delta Gold) at 0.018 to 0.028 lb ai/a. PHI 3 days. REI 12 hr. Retreatment interval 3 days Do not exceed 0.168 lb ai/a per season. imidacloprid (Admire Pro) at 0.25 to 0.375 lb ai/a. Soil application only. PHI 21 days. REI 12 hr. malathion (Fyfanon 8) at 1.75 lb ai/a. PHI 1 day. REI 24 hr. Retreatment interval 7 days. Do not exceed 2 treatments. methomyl (Lannate SP) at 0.45 to 0.9 lb ai/a. PHI 1 day at 0.45 lb ai/a or 3 days if over 0.45 lb ai/a. REI 48 hr. Limit 12 treatments per year. Do not exceed 5.4 lb ai/a per year. novaluron (Rimon) at 0.06 to 0.078 lb ai/a. PHI 1 day. REI 12 hr. Retreatment interval 14 days. Do not exceed 0.23 lb ai/a per year. oxydemeton-methyl (MSR Spray Concentrate) at 0.375 to 0.5 lb ai/a. PHI 14 days. REI 14 days. Limit 1 treatment per crop. permethrin (Ambush 25W, Pounce 25W) at 0.1 to 0.2 lb ai/a. PHI 0 days. REI 12 hr. Do not exceed 1.2 lb ai/a. Retreatment interval 7 days. thiamethoxam (Actara) at 0.047 to 0.086 lb ai/a. Suppression only. Apply high rates for heavy infestations. PHI 0 days. REI 12 hr. Minimum interval between treatments 5 days. Do not exceed 0.172 lb ai/a per season. thiamethoxam (Platinum) at 0.078 to 0.172 lb ai/a. Suppression only. PHI 30 days. REI 12 hr. Do not exceed 0.172 lb ai/a per season. Apply to the soil as in-furrow spray, band application, drench, shanked or with irrigation. Platinum and Actara have the same active ingredient; for resistance management, do not follow one with the other. zeta-cypermethrin (Mustang) at 0.028 to 0.05 lb ai/a. PHI 1 day. REI 12 hr. Do not exceed 0.3 lb ai/a per year. Retreatment interval 7 days.